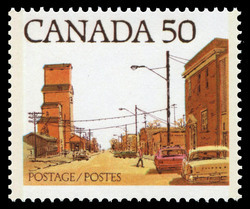 The Canadian 50-cent Prairie Street Scene stamp has a unique story to tell. It was issued by two separate printing companies, and it contains a few fascinating varieties. 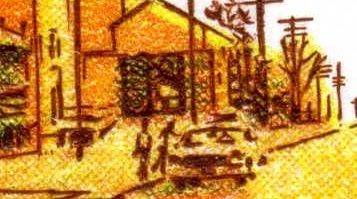 First off, when this stamp was initially released, the postal service did not publicize the location of the prairie town. For a while, it was unknown, but enthusiastic collectors eventually concluded that the small town pictured on this stamp was actually Austin, Manitoba. 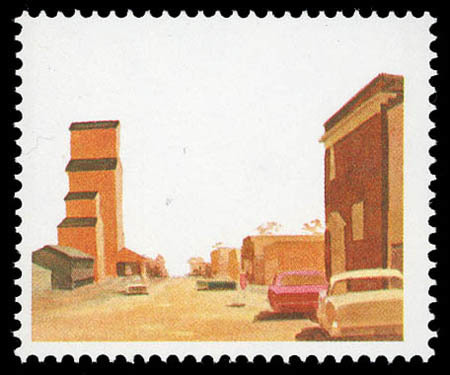 The Prairie Street Scene stamp was first issued on July 6, 1978. These stamps were printed by the British North American Bank Note Company (BNAB) using a technique called photogravure. The term "Photogravure" comes from the English word photo and the French word gravure, which means "engraving". Photogravure is a photo-mechanical (or intaglio) printing process where a copper plate is covered in a sensitized gelatin that hardens via exposure to light. When this gelatin is exposed to a photograph negative, it hardens on the copper plate in proportion to the light that passes through the negative. Once this is completed, the picture can be seen in the various densities of the gelatin on the copper plate. Finally, the copper plate is exposed to an acid that pierces through the gelatin, etching the copper plate beneath. After the gelatin is washed away, the copper plate will have deep etches where the image is the darkest and shallow etches were the image is lighter. This copper plate is then covered in ink and stamped onto paper. 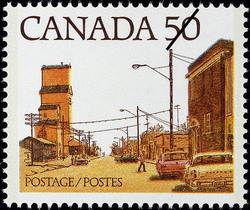 The second set of the Prairie Street Scene stamps was released on December 13, 1978 by the Canadian Bank Note Company (CB). CB used another printing technique call lithography. Lithography utilizes the immiscibility of oil-based inks and water by dampening the printing plate with water and forcing the ink to stick on the dry services of the plate. BNAB placed the date in the door of the grain elevator. 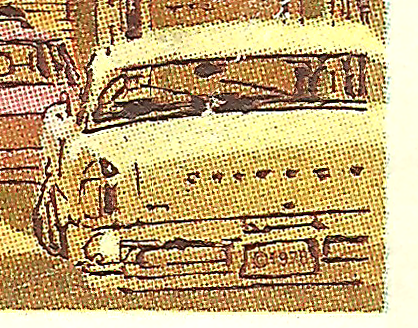 CB concealed the date on the license plate of the car in the bottom, right-hand corner of the stamp. Both printers issued stamps in panes of 50, five columns wide and ten rows deep. BNAB printed 8,650,000 stamps, and CB printed 85,250,000 stamps, nearly 10 times more. There are also 3 stamp varieties, one from BNAB and two from CB. In the panes printed by BNAB, stamp 5 (row 1, column 5) has a small red dot above the 5. This anomaly occurred on roughly half of the panes that were printed. Thus, 1 in 100 of the stamps printed by BNAB has this red dot, which means there are only 86,500 in existence. 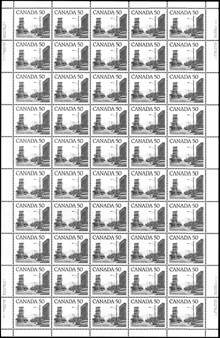 In the panes printed by CB, all five stamps in the second horizontal row have a dark spot on a car's bumper. This irregularity has been termed "the dented bumper", and it occurred on every pane printed by CB. Thus, 1 in 10 of the stamps printed by CB has this dented bumper, which means there are 8.525 million in existence. In the panes printed by CB, stamp 22 (row 5, column 2) has a black dot overtop the person walking across the street. 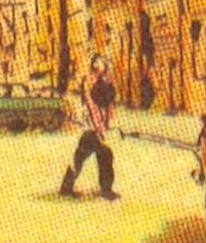 This defect has been termed "the black sweater", and it appeared on every pane printed by CB. Thus, 1 in 50 of the stamps printed by CB has this black sweater, which means there are 1.705 million in existence. Finally, there is a rare variety of this stamp called the "Ghost Town" in which all the brown inscriptions are missing. These stamps were printed by CB.